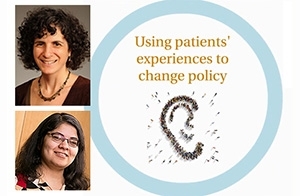 Senior Scientist Rachel Grob, MA, PhD, (top) and Nancy Pandhi, MD, MPH, PhD, presented at the most recent UW School of Medicine and Public Health (SMPH) Mini Med School, held June 4, 2015. Department of Family Medicine and Community Health (DFMCH) Assistant Professor Nancy Pandhi, MD, MPH, PhD, and Senior Scientist Rachel Grob, MA, PhD, were presenters at the most recent UW School of Medicine and Public Health (SMPH) Mini Med School, held June 4, 2015. In keeping with the theme of this session, organized under the leadership of the Center for Patient Partnerships and titled “Partnering with Patients in Health Care,” Drs. Grob and Pandhi spoke to 300 community members about how patient experience research can be used to improve care and shape health policy. Dr. Grob showed the group how “complete, balanced, meaningful and representative” patient experience narratives can provide important qualitative evidence to guide health care practice and policy. She and Dr. Pandhi are part of a national initiative to bring a rigorous international patient experience research initiative, which includes videos of patients speaking in their own words, to a U.S. audience. The work will be available via a public website similar to ones created by members of DiPEX International in nine other countries. Dr. Pandhi described how she and Dr. Grob are now using the DIPEx methodology for the specific purpose of studying young adults’ experiences with depression. Their team is currently interviewing patients in five U.S. states. In terms of policy or system change recommendations, one stand-out recommendation they have heard from patients is the ongoing need to increase awareness and reduce stigma associated with the disease. Mini Med School sessions are community-oriented events designed to explore compelling health issues. They encourage audience participation. In line with this commitment, the Center for Patient Partnerships surveyed attendees in advance of the event about how they engage with the health care system. Below are some of the results from this survey that Dr. Grob (who has a joint appointment at DFMCH and the CPP) presented at the event. Overall, 89 percent of attendees considered themselves “very” or “extremely” engaged in their health care, and did this primarily by becoming self advocates and avoiding unnecessary tests and treatments. Only 27 percent of attendees were “very” or “extremely” engaged in improving how care is provided by health care organizations; many cited obstacles as lack of opportunity, skills or knowledge. Even fewer attendees—14 percent—were “very” or “extremely” engaged in improving health policy. Other speakers at the session were Meg Gaines, JD, LLM, and Sarah Davis, JD, MPA, director and associate director of the UW Center for Patient Partnerships; Elizabeth Cox, MD, PhD, associate professor in the UW Department of Pediatrics; and Marje Murray, director of geriatrics services at UW Hospital and Clinics, speaking on behalf of Margaret “Gretchen” Schwarze, MD, who was unable to attend.